Vegas Uncork'd — Where will you be checking in next? Las Vegas has become, over the years, a high-level gastronomic city distinguished by its important "star-system" of chefs. Indeed, the vast majority of celebrity chefs we know (Gordon Ramsay, Giada De Laurentiis, David Chang, Thomas Keller, Wolfgang Puck, to only name a few) operate restaurants on The Strip. 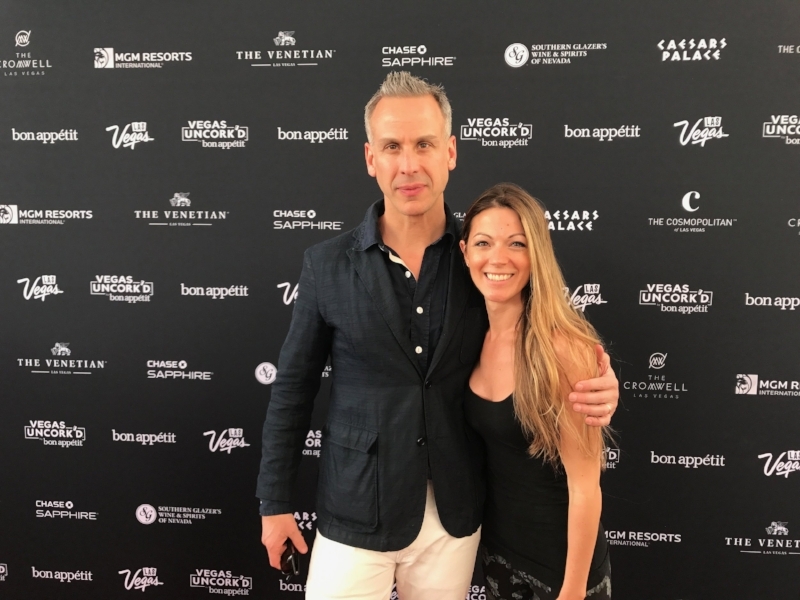 The Vegas Uncork'd festival, which has been taking place for the past 11 years on the last weekend of April in Sin City, is just the culmination of this strong, jetset-filled culinary identity that defines Las Vegas. For three days, the greatest chefs succeed one another in a series of events all more impressive than the other. Watch my (bilingual) video of last year's edition of Vegas Uncork'd! Lunch like a Spanish - Spanish cuisine magnate José Andrés runs Jaleo, a restaurant located in the Cosmopolitan Hotel. On this special occasion, the star chef was in town to cook a giant paella in front of 200 lucky guests. The menu featured José's specialties: chicken croquettes, bikinis sandwiches, mini burgers, charcuterie and olives, in addition to an open bar of gin-tonic, the typical Spanish cocktail. The "Grand Tasting" at Caesars Palace is probably the most anticipated event of the festival. It takes place in the impressive gardens of the Caesars Palace hotel. The festival's signature event brings together nearly 2,500 people who sip champagne between stops at some of the 100-food kiosks. These kiosks are in fact pop-up versions of restaurants such as: Gordon Ramsay's, Giada De Laurentiis's, Mr.Chow's, François Paillard's, etc. Ultimate Throwback Dinner with Mr. Chow - Maximillian Chow hosted the first anniversary party of the Las Vegas outpost of Mr Chow restaurant inside Caesars Palace. The menu featured dishes from the original UK location (now celebrating its 49th anniversary). The Vegas Uncork'd festival will be back for a 12th edition in April 2018. Tickets are usually on sale a few months before the festivities start. The participating hotels (Cosmopolitan, Caesars Palace, Venetian, Palazzo, Cromwell) offer, for the occasion, preferential rates on the rooms.